If you live in the southern part of the country, you know that we didn’t have much in the way of winter weather this past season. And it started getting hot early this year. Like in March. But just lately, we’ve had real summer heat. Here in north Georgia we’ve had low 90’s with the ever-present summer humidity. Don’t get me wrong – I love the warm weather. Winter makes me miserable. I just want to wrap up in a blanket and stay there until spring. So when warmer weather comes around, I’m always a happy girl. I will be the first to admit, though, that the warmth and humidity is a strength sapping combination. Just a little yard work and you can’t wait to get back inside to the nice cool air conditioning. Whatever did we do before air conditioning? I actually do remember it and it was tough. On these hot days, you need something to restore your cool. To refresh and replace your energy. And I think I’ve found just the thing to do that. This lovely infused water can be made quickly and kept in the fridge for a couple of days refilling your pitcher as needed. Infused water or agua fresca (literally “fresh water”) is, I believe, part of Mexican cuisine. I’ve never been to Mexico, but I understand that agua fresca is a popular item sold by street vendors there. It’s a combination of fruits and vegetables, sometimes herbs, with water. Sometimes sweetener is involved and sometimes not. It’s left to sit and allow the fruits and veggies to impart their delicate flavors into the water. And that’s all there is to it. Simple, huh? I’ve tried lots of combinations and have to say that this combo is one of my favorites. I’ve tried it with herbs, too, but for me the herbs are just overpowering. I prefer only the fruit and veggies. And I like mine with a little sweetness. Start by prepping your fruits and veggies. For this infused water, I used cucumbers, strawberries, and pink grapefruit. It’s also good with oranges if grapefruit just isn’t your thing. For the cucumbers, I peel away all but a few strips of green because I find the cucumber peel imparts some bitterness that I don’t especially care for. You do whatever you like. 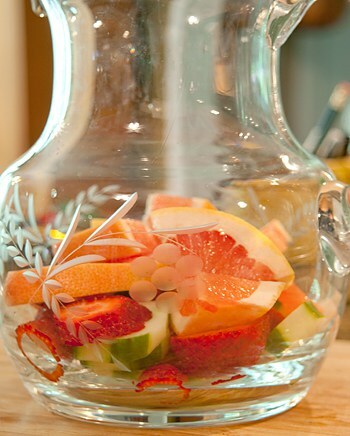 Layer your fruits and veggies in a pretty pitcher. Then dissolve the sweetener (use whatever you like – I use Splenda) in a couple of cups of water and pour that over the fruit. Finish filling the pitcher with fresh tap or bottled water. Cover and refrigerate for several hours to give the flavors time to infuse. Serve over ice. Refreshing water infused with fruits and vegetables. Peel the cucumber leaving only a few thin strips of green peel. Slice thinly and place in a two quart pitcher. Hull the strawberries and slice crosswise. Place them in the pitcher. Cut the ends off the grapefruit. Slice into thick slices, then into wedges. 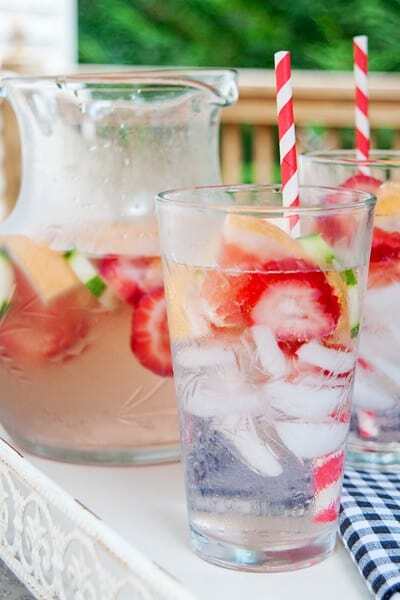 Place the wedges in the pitcher with the cucumber and strawberries. Dissolve Splenda in two cups of water. Pour into the pitcher and fill with additional water. Refrigerate for two to three hours. Serve over ice with some of the fruit as garnish in each glass. Thanks, Denise. It’s really good on a hot, humid day. This is so appealing to the eye that I must try it to see how it tastes! I had some cucumber water one time at a bloggers conference and it was surprisingly delicious! I like the cucumber in it, too, Kathy. It adds a little something unexpected. This looks perfect for summer. I usually drink water and put in a slice of lemon sometimes, this would be 10 times better! It’s so much better than just plain water. You can use whatever combination of fruits you like and sweeten or not according to your taste. It sounds so delicate and a great way to get in those fluids! I also want to try fruit “shrugs”. Here is a recipe for it. It also sounds interesting…. Not a bad idea, Barb! Heather – the pink grapefruit really makes for a refreshing mixture. Orange is just as good, as is lime. Hi Lana!! I’ve had these in Mexico and they truly are refreshing – in those versions they mashed the fruit pulp and added water and sugar – but given how much water I drink, your version is much better! It really is such a pretty way to serve water… and tasty too! My favorite one is cucumber, mint and lemon…. it’s just about time to start mixing some up here in So Cal although it’s not nearly as warm here … yet! There are really endless combinations for this infused water. Only problem is that it’s almost too pretty to drink! You can use any sweetener that you like. Is it really necessary to add any sweetener?? All of the authentic agua fresca recipes I’ve seen add sweetener of some kind. How refreshingly looking! Thanks. That’s a LOT of Splenda. We use Truvia which is completely natural, plus we’d switch the grapefruit with oranges since grapefruit interacts with our meds. I do appreciate you sharing this! Happy Summer. I would leave off the Splendid and use Stevia. Splendid is no healthy where Stevia is, for its a natural sweetner with zero calories. It does have a slight after taste at first, but after using it for awhile, its not noticable any longer. I believe you’re referring to “Splenda”? You may certainly use any sweetener you like. Even sugar.